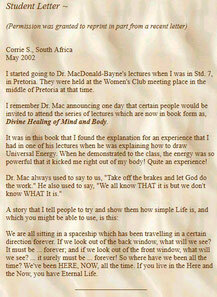 I started going to Dr. MacDonald-Bayne's lectures when I was in Std. 7, in Pretoria. They were held at the Women's Club meeting place in the middle of Pretoria at that time. 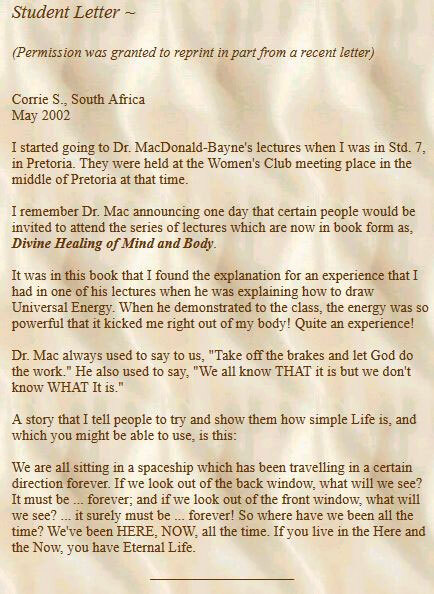 I remember Dr. Mac announcing one day that certain people would be invited to attend the series of lectures which are now in book form as, Divine Healing of Mind and Body. It was in this book that I found the explanation for an experience that I had in one of his lectures when he was explaining how to draw Universal Energy. When he demonstrated to the class, the energy was so powerful that it kicked me right out of my body! Quite an experience! Dr. Mac always used to say to us, "Take off the brakes and let God do the work." He also used to say, "We all know THAT it is but we don't know WHAT It is." We are all sitting in a spaceship which has been travelling in a certain direction forever. If we look out of the back window, what will we see? It must be ... forever; and if we look out of the front window, what will we see? ... it surely must be ... forever! So where have we been all the time? We've been HERE, NOW, all the time. If you live in the Here and the Now, you have Eternal Life.